May 29, 2010 A trip back to a lake that I fished five days ago confirms my suspicion that the Walleyes are beginning a move out of their spring feeding areas toward deeper open water structure. I fished three spots where good numbers of fish had been present earlier in the week and found all three of them empty. I made a move out to deeper water where there is a soft bottom adjacent to a reef with mixed rock and weeds. Walleyes were staggered along the outside edge of the breakline and when I inspected the stomach contents of the fish while cleaning, I discovered all of them contained insect larvae instead of minnows. During the past two days I've been gradually switching over from all minnows and jigs to a line or two rigged with night crawlers. On Thursday the night crawlers began to produce almost equally to the jig and minnow. We also watched a boat land several fish while using slip bobbers and leeches in the same area. Similarly, Crappie location has begun to shift as well. We spent some time scanning the shallow bulrush areas for evidence of spawning Crappie and discovered a few fish, but we also found a few fish out in an area where cabbage weeds cover a shallow flat adjacent to deeper water. This is a typical early summer location and an educated guess tells me that all of the Crappies will be in this type of cover within the next few days. May 27, 2010 More warm weather this week, but this time with great fishing winds! This week, Walleye fishing has been the best of the season so far. Except for a few housrs last Sunday, we've had great drifting winds all week long and the fish are showing their appreciation. Crappie fishing has generally been good, but I can see some evidence that the fish in many lakes are already finishing their spawning cycle and moving into deeper weeds. If you check the shallow spawning beds and find them empty, look for mixed Cabbage and Coontail weed patches nearby. Crappies stop in these locations after spawning and they can be very aggressive. May 24, 2010 The weekend was quite an adventure for us. A storm cell with high winds and big waves blew us off the lake on Saturday, but after the storm, we made one of our famous 11th inning comebacks to score on some great Crappie action! Sunday, no wind and sunny skies made fishing tough but we stayed out for the "evening bite" and made another big comeback. I guess the moral of the story is that you have to stick with it if you want to win the game. Walleye fishing continues to come and go with the wind. On Saturday as the wind blew, everyone I talked to on every Walleye lake in the Deer River area was catching fish. The windy conditions really turned the fish on and the feeding frenzy lasted all afternoon. By Sunday, calm sunny skies returned and the fishing story was the complete opposite. Sluggish fish gave anglers the occaisional bite, but nothing like the day before. If you have the ability to schedule your fishing to take advantage of a good breezy day, do it. If nice weather causes Walleye Lock-Jaw, schedule your fishing for the evening or early morning to help swing the odds in your favor. 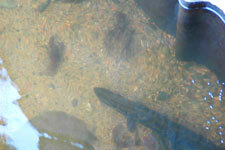 Crappies appear to be wrapping up their spawning runs and moving toward slightly deeper water. I hope to do some more Crappie fishing in the next day or two and should have more to add as we see what happens. May 22, 2010 Since mid-week, I've spent most of my time fishing Walleyes and for me, the hottest bite has emerged on Red Lake so I've spent the past few days heading up there. The secret to great fishing up there has been to find the isolated rock piles and cncentrate your efforts there. Even though there are some fish on the shallow breakline, the rock piles are much better. Jig and minnow is working just fine, but I've been playing with the artificials and I can't say enough about the Berkley Ripple Shads that I've been using. These small power baits teamed up with an eigth ounce long shank jig are easily keeping up with the live bait. Today we'll be leaving the Walleyes alone and targeting Perch, Crappie and maybe even sunfish if the opportunities look good. I'll try to expand on the panfish report in the next day or two. May 18, 2010 The weekend weather was about as perfect as you can get for any fishing opener. 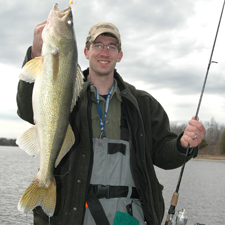 Reports about the Walleye action have been mixed, but there are some highlights. On Saturday and Sunday the majority of the Walleye we found were spread out on large flats in the 10 to 12 foot depth range. As the water warmed up on Sunday afternoon there was some evidence of the shiners moving back toward the shoreline and from 3:00 to 5:00 PM there was a good flurry of action in the 8 to nine foot range on the shoreline. Perch action followed from 5:00 on until we left the lake. On Monday, we tried to locate Walleyes on the same large flat where we found them on Sunday, but now they had moved and the area was inhabited by Perch. We spent a couple of hours catching Perch and then satarted checking closer to shore for Walleyes. By 3:00 PM the action was in 5 to 7 feet of water again on the shoreline, so it appears that the afternoon sun is getting these fish fired up. We've heard similar reports about improved afternoon action coming from Leech Lake and Red Lake too. Perch fishing has been been way above average for this time of season and we've been enjoying the bonus action whenever we stumble into a school. We're catching mostly male fish that still appear to be trying to spawn. The lack of female fish makes me think that maybe we're seeing the tail end of the spawning cycle. So far we haven't fished with anything except jig and minnow, but I have already heard some good reports about leeches, so it wouldn't be a bad idea to have a few on hand. 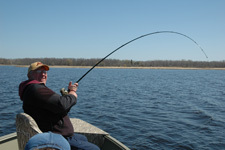 May 16, 2010 The weather was perfect for the 2010 Minnesota Fishing Opener. As predicted, the fish were already dispersed from their spawning areas and spread out across large main lake flats in 10 to 12 feet of water. Water temperatures ranged from 51 to 54 degrees so I'm guessing that there will be another move back toward the shallow breaklines as warming water triggers another movement of baitfish toward the shallows. Now that we've had a day to get some ideas, fishing on Sunday should be interesting as we try to refine the game plan. Watch for a more complete update on Monday morning. May 12, 2010 With two weeks of crummy weather and a back log of work to finish, the Walleye fishing opener this Saturday can't get here fast enough for me! During the April warm spell, lots of people were speculating about finding fish in early summer locations. With two weeks of night temperatures back down into the 30 degree range, the baitfish aren't fully spawned out and the shallows will still be the place to start. Since the Walleye spawned so early this spring and the females have had more time to recover, we just might see an above average opener for large fish. Another thing to consider will be the possibility of opening up on some of the lakes that are generally known for later action. April 29, 2010 Panfishing in the Grand Rapids and Deer River area continues to heat up. All of the sunshine combined with low water levels have pushed surface temperatures into the mid 50 degree range. On Tuesday, my daughter and her boyfriend spent an evening Crappie fishing and the action wasn't fast, but it was steady. They managed to keep 20 Crappies by the time they finished. Most of my friends that have hit the lakes this week have had similar results, decent catches of Crappie and Sunfish are the rule. My plans for the weekend include an appearance at the Frontier Sports Spring Fling in Marcell on Saturday May 1, 2010. 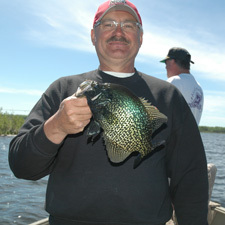 There will be three fishing seminars beginning at 12:30 with Tom Neustrom doing a spring Crappie Fishing seminar. 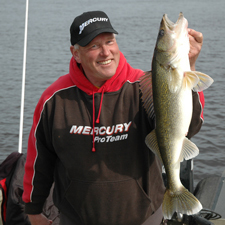 My seminar, "When Walleyes Want Meat, Rig 'em Up" begins at 1:30 PM and the seminar schedule wraps up with Brian "Bro" Brosdahl at 2:30 PM. 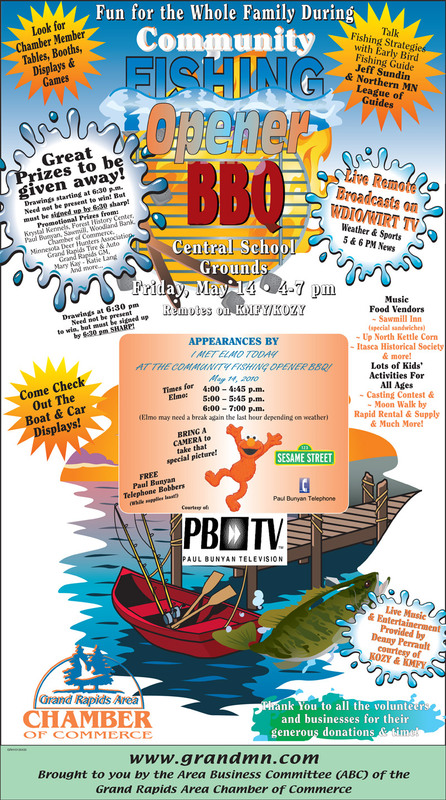 In addition to the fishing seminars, there will be a kids casting contest, free food and plenty of time to chat will all of us about your plans for the fishing opener. Today (Thursday) I head down for the Walleye Advisory Committee meeting with the Minnesota DNR. On the agenda will be a report about the Walleye Stamp, Walleye Stocking plans for Leech Lake, the discovery of VHS in Lake Superior and a discussion about the managent plans for Minnesotas Lakes in 2010. Check back on Friday for an update about the meeting. 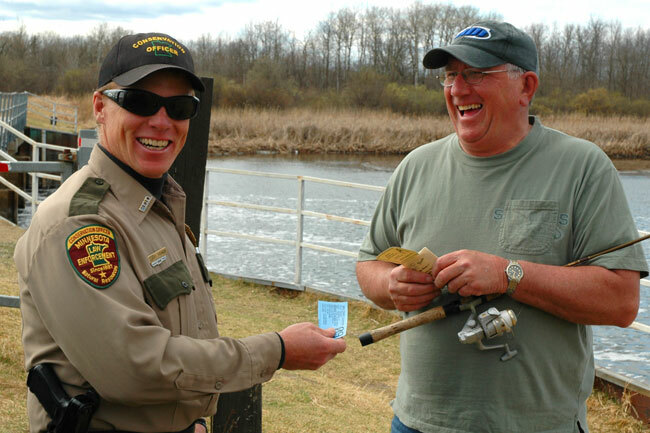 After May 1, 2010 you'll need to get your new fishing license. 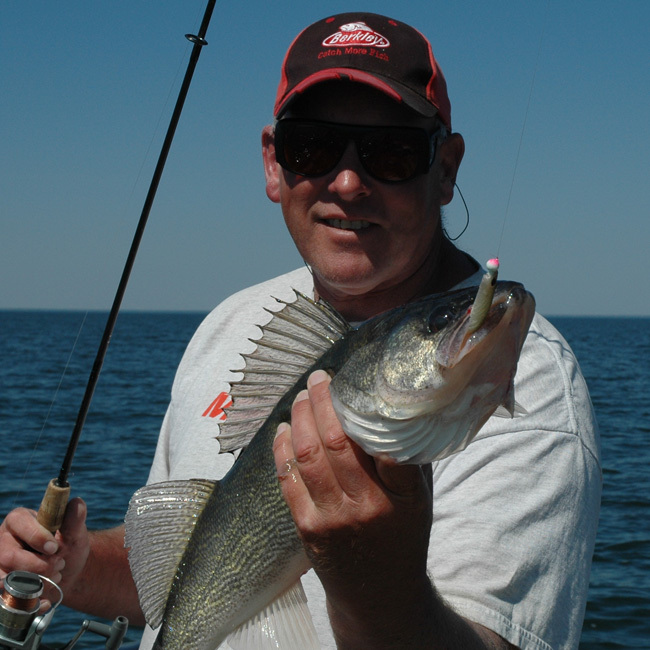 If you love to fish for Walleye, please consider adding on the voluntary $5.00 Walleye Stamp. The proceeds of this stamp go directly for Walleye stocking and management and it's a good way to show support for your sport. 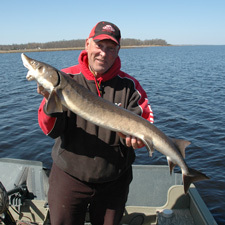 April 23, 2010 On Thursday we ran up for a day of Sturgeon fishing on the Rainy River. We had been told by fishing pals that the fishing had been spotty with catches ranging from just a few, to upwards of 25 fish on the better days. Our action was somewhere in between, staying in the Wheelers Point area for the entire day, we managed to boat a total of 9 Sturgeon ranging from 30 inches up to a 40 incher. Not monsters, but tough enough to put up a tussle. We did watch one group of fishermen boat a 60 incher and I'm sure that there were other good fish caught. Among the boats in view, we saw slow-but-steady action throughout the day. If you've never done it, Sturgeon fishing is fairly simple. You'll need a heavy rod matched up with a level wind (bait casting) reel. Musky Rods or heavy Bass Flippin' Sticks are good. I've found the perfect rod for me is the G.Loomis "Frog Rod" which has all of the backbone for landing big fish and a tip that's soft enough so you can feel the delicate tick-tick of a Sturgeon bite. Our presentation is a lot like a live bait rig that you'd use for Walleye fishing, we use a 1 to 2 ounce sinker like a bell sinker or even a heavy lindy rig sinker, a good strong swivel and a leader of 17 to 25 pound monofilament or fluorcarbon line. A 1/0 or 2/0 hook strung up with a night crawler finishes off the rig. Fish for Sturgeon by finding the edges of a deeper hole and anchoring the boat on the shallow side of the drop off, allowing your sinker to sit on the bottom in the hole or along the edges of the hole where shallower water drops into the deep hole will give the fish a chance to find and inhale your night crawler. After that, keep tight line and have fun. Panfish are responding to the warm up of our area lakes too. After several days of constant sunshine, shallow bays have warmed into the mid 50 degree range and isolated bays, canals and areas along cattail of other heavy vegetation are filling up with Bass, Sunfish and Crappies. On a couple of the big lakes, Perch are also moving in the shallows need submerged weeds. Barring a sudden change in the weather, this weekend should be a great time to get out and experiment. April 16, 2010 After a day in the office on Thursday, the nice weather was calling me to get outside so we took a little drive to see if we could find some Suckers running in the river. The river water was really low and it was warm and sunny when we got there. This is usually a recipe for good Sucker fishing and as we expected, there were a lot of fish milling around so it looked like a good bet that we'd get a bunch of them. I dropped in a plain jig with a 3 inch pink twister tail and caught one almost immediately and a few minutes later another. Then the weather started getting cloudy and the fish moved away from the current and out into the main river channel where they tend to spread out. After that we caught a few more including a couple of more keepers and some small ones that we tossed back. That's enough fish to give me an excuse to fire up the smoker, so that's on the agenda for Friday. I caught a news release from the MN DNR website about some rivers that they've closed to Sucker fishing to protect spawning Walleyes. For reference, I pasted the notice below this report, it doesn't say if there will be additional closings so I'd be sure to check before I started fishing in areas where you know a lot of Walleye spawn int he spring. Speaking of spawining Walleye, the stripping operation up at Cutfoot Sioux will probably be winding down in the next day or two, as of Tuesday, they were over the half way mark. The last report was that the water temperature was above 47 degrees and while the spawning run hasn't been intense, it has been steady. Minnesota Walleye Stamp - In 2009 most Minnesota anglers never heard about the voluntary $5.00 Walleye stamp that was introduced as a way of generating funds to be devoted to Walleye production, stocking and spawning habitat. Although the state has launched an ad campaign to make folks more aware of the stamp, the first three people I've talked with after they bought new 2010 fishing licenses, were not offered or made aware of the stamp. All three said that they would have bought one if they'd been asked. If you're like me and you think that an extra $5.00 bucks to enhance Walleye fishing in Minnesota is a good idea, then please be sure to ask for the stamp when you get your license this spring. If you're at the store and they don't offer you the license at the counter, ask them to please start mentioning it. Stream-River Closings: Six streams in Beltrami and Clearwater counties are closed to angling and rough fish spearing through Friday, May 14, to protect concentrations of spawning walleye and their eggs. "Blackduck River, County Road 32 north to Red Lake Reservation boundary, Clearwater River, below Clearwater Lake Dam for 900 feet, Mississippi River, below Ottertail Power Dam to County Road 12, Shotley Brook, Minnesota Highway 72 to Upper Red Lake, Tamarac River, Upper Red Lake to Beltrami-Koochiching county line, Turtle River, between Three Island Lake and Turtle River Lake. 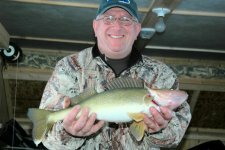 Due to early spawning conditions this year and a later fishing opener, none of these closures will be extended beyond the statewide walleye fishing opener on May 15, 2010." April 12, 2010 Sunday was probably my last trip chasing Rainy River Walleye for this spring. Two of my fishing buddies Arne Danielson, Chad Haatvedt and I drove up to Birchdale and found a gorgeous spring day waiting when we got there. The water temperature had gone up another degree or two and the feisty male Walleyes were still on the prowl. The current flow was even slower than before and the 1/4 ounce jigs we had used on the past two fishing trips were just too heavy for our liking. We tried a variety of lighter jigs, but Chad had tied on a perch pattern, 1/8 ounce Bug Eyed Shorty and he was catching the most fish. Even though we caught some fish on other colors, by the end of the day, we had all switched to the lighter jig in the Perch (yellow-green-orange) pattrern. The sun was bright and with light wind and clear water, the fish were a few feet deeper than before. Ten to twelve feet was a good working depth for most of the day. Late afternoon the water warmed up to almost 47 degrees and the fish got a bit more aggressive and they moved just a bit shallower. A change we noticed on sunday was that Sturgeon started showing up. We saw a few of them caught and a couple of others working the surface. Chad hooked a mid-50 inch size fish that pulled us around for a while as well. Next time we go up, we'll try to get even with that one. Since we ran into several of my guide friends up there, I added a few of the pictures to the fishing guides facebook page too. Check them out if you like. April 11, 2010 Our return trip to the river on Friday was a completely different experience from the Thursday trip. The big fish bite that had gotten everyone's attention for the past week has really simmered down and now the smaller males were super aggressive. I and my fishing buddy Matt Mattson arrived at the river at about 11:00 then hooked up with some friends from my guide group and they had already been catching fish steady for most of the morning. Our first couple of drifts were slow as we figured out what we needed to do in order to get fined tuned, but once we got into the game the action was wide open for several hours. What the fish lacked in size, they made up for in numbers as we caught lots of fish in the 16 to 17 inch range with an occaisonal 18 to 19 incher thrown in for good measure. We were hoping to at least catch a couple of larger fish and we did eventually each catch one for some good pictures. Our best action came in shallow water (6 to 7 feet) with a sand/gravel bottom adjacent to a hole that ran about 9 to 10 feet deep. The fish were concentrated along the bottom (downstream) edge of the hole where the water flowed up on to the shallow flat. The current flow is light up there right now so I held the boat on the edge of the hole with the electric trolling motor and we pitched our 1/4 ounce jigs up on to the shallow edge. Hop the jigs back toward the boat and you'll have all the action you want. Our best presentation was a 1/4 ounce jig like a fireball or a plain roundhead jig tipped with a minnow. We tried several types of plastics thinking that the aggressive fish would bite just as well, but except for a handful of fish that I caught on a Berkly Ripple Shad, the majority of our fish really seemed to prefer minnows at least on this particular day. The Walleye season on the Rainy ends on the 14th, but if you can fit one more trip into your schedule and the weather doesn't change violently, you should have a good time up there. April 9, 2010 I made a trip up to the Rainy River yesterday (4-8) with my favorite uncle Pete Raquet and we found the water conditions low and current flow slow. Water temperature was 45.4 degrees when we left the river at about 5:00 PM. It's hard to tell if we hit the tail end of the peak bite or if the cold snap that blew in on Wednesday night took the action down a notch. While the action was pretty good, it did not live up to the reports that we'd been hearing for the past few days. The two of us did manage to boat some really nice fish though and there was enough action to keep the fishing interesting for most of the day. Our largest fish was 27.5 inches and there were 8 to 10 more fish between 20 and 27 inches, a half dozen nice 16 to 18 inch keepers and a bunch of little Walleye and Sauger. We did see a young man catch a nice 30 inch Walleye and snapped a photo for him. With the slow current flow, the fish were scattered and we caught them in almost any depth from 12 feet down to 22 feet. Early in the day, fish seemed to want us to fish the jig almost motionless, but as the water warmed up they liked a little more action. By late afternoon I had to use the Minn Kota to back troll with the current just to keep the boat moving enough to allow us to pop the jigs as we trolled. I'll be back up today to see if there's a little more action to be had, so I will drop another report tomorrow morning. April 1, 2010 Easter weekend is going to be full of choices for fishermen around the northland. We've got a handul of small lakes open already and as I drove around the area on Wednesday, I saw several more lakes that are on the verge of opening up as well. Crappie, Bluegill and Perch anglers, now is the time to look for the inlets and back that are opening up. Assuming that the weather holds, the panfish will be moving into these areas right now. 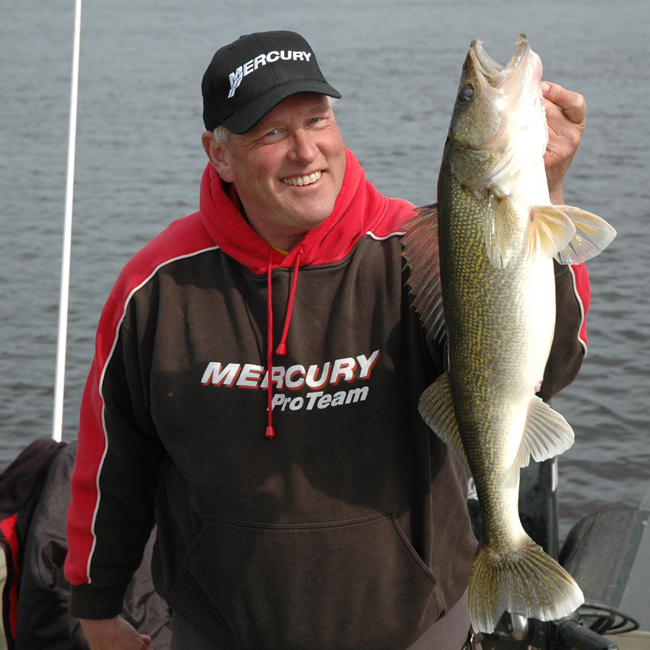 Walleye anglers heading toward the Rainy River are reporting improved catches every day and thanks to the extra time we're getting this year, the crowds are spaced out a little better than during the typical spring crunch we've seen in the past several years. At 11:30 on Thursday morning I talked with three of my guide buddies while they were fishing the Rainy River and they had already caught 18 Walleyes with the best part of the day still to come. Water conditions are on the low side, but plenty fishable. On Wednesday evening, my daughter and a friend went down to check on the Suckers in a local river and came home with a dozen nice sized fish for smoking. So now the only question is what to do next. 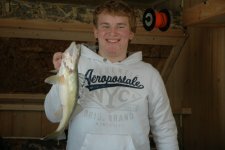 Panfish, Walleyes or Suckers? Maybe all three if we play our cards right. For the next 50 days we'll be keeping an eye on the lake conditions as we ead toward the 2010 Walleye opener. Keep an eye open for some upcoming spring fishing events and promotions. 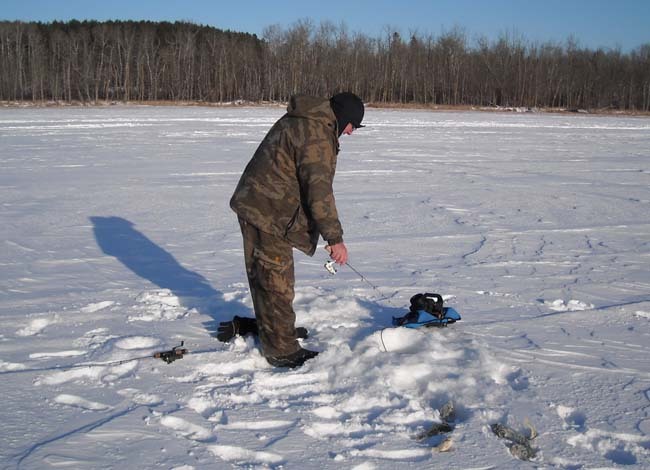 3/19/2010 The weather might be giving you one last chance to get out and do some ice fishing this weekend. 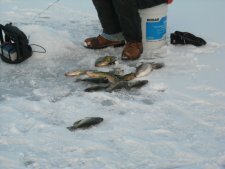 On Wednesday, we had almost written off the rest of 2010 for any more ice fishing trips. In fact, I had the boat hooked up to the truck and our plan was to head on up to the rainy river. After a call from some friends who drove up there on Tuesday, the reports were not good. They made the fishing sound so slow that we decided to wait on that trip and hit the lake for one more ice fishing trip. We got out to the lake about 1:00 PM and using the 4 wheeler was no problem. We saw a really close call when a couple of guys came out on to the lake in pickup trucks, parked and soon figured out that water was pooling around their front tires. They drove back to shore and hoofed it back out to finish fishing, but by the time we left the ice, there was open water on the shoreline where we came out. It got just cold enough last night to stop the thaw and if we get some more of that cold weather tonight, conditions might remain okay for the weekend. The good news is that the Perch fishing was really pretty good once we got out. We kept about 50 Perch for three people and let many small fish go. We stayed in the 7 to 10 foot range and the fish were active enough to bite on most anything we used. 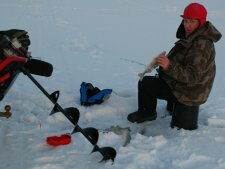 If you're finished ice fishing for the season and not too far from Grand Rapids. Head over to the Jaycees Home and Sport Show on Saturday and chat about the upcoming fishing season. The fishing semninars will start at 10:00 AM and continue most of the day. I will do a seminar at 1:45 PM "When Walleyes Want Meat, Rig 'em Up" and you can stick around to see a seminar by Mr. Walleye, Gary Roach at 4:15. Your kids can visit us at 5:30 PM for the Northern Minnesota guides League Kids Casting Contest and register to win some great prizes. 3/12/10 This ESPN fishing article "Culled Out" by Robert Montgomery caused quite a stir over the past few days. I've been following a thread on facebook from the Keep America Fishing page and I've heard a lot of radio and tv reports mention the article. As the rumors spread through the fishing world, the federal government issued a statement meant to ease the tension and calm anglers fears about a possible nation-wide fishing ban. ESPN has since issued a clarification to the original artilce that back-tracked from Montgomery's original article. For the moment, the best course of action for all of us with concerns about the future health of the sport fishing industry is to do our homework. While you're waiting for the ice to melt, you might as well take a look at the original reports that caused all of the stir in the first place. Here's a link to the report Effective Coastal and Marine Spatial Planning and by the US Interagency Ocean PolicyTask Force. After you read the report, make your own judgement about whether we should be concerned or not. 3/10/10 Ice fishing is still going strong in the Deer River area, the melt down has erased most of the snow cover and anglers are moving around freely on the lakes. So far the ice is holding up well, but we're going to need some cold nights soon or the shorelines will break up early this year. Some of my fishing buddies made it out over the weekend and reported fair Crappie and Perch action in the 20 to 24 foot range. The Bluegill action is hanging in there too, but a little shallower has been better. The 16 to 20 foot depth range has been reliable, but on my last trip out, 10 to 12 feet was better. The winter fishing season is coming to an end for me. Writing articles, doing personal appearances and going to meetings will be taking a lot of time during the upcoming weeks. This weekend I'll be at the Ray's Sport & Marine Boat Show at the IRA Civic Center in Grand Rapids, MN on Friday evening, all day on Saturday and Sunday. There's some trouble in the news for anglers this week and while it's a little early for a full scale panic attack, you'd be smart to take a look at this ESPN article about the future of fishing in our country. Would our government really ban fishing? 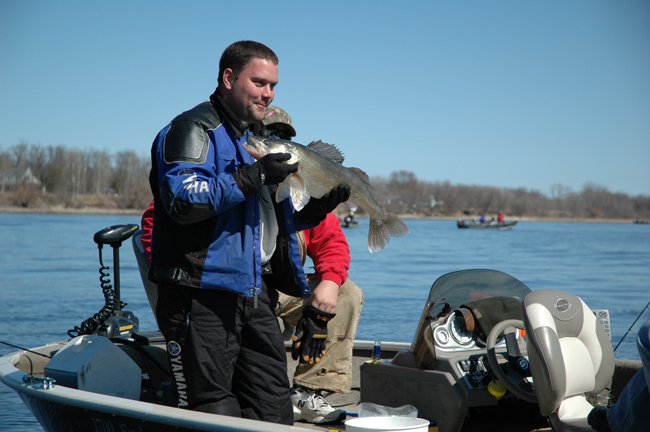 3/3/2010 The warm weather continues to tempt anglers with a case of early onset spring fever. Like a lot of other fishermen, I've been taking some afternoons off and hitting the lakes too. The driving conditions are improving daily now that the warm weather is melting down some of the drifted snow. The high temps today are predicted to be into the low 40 degree range, so I think we might be on the way to a serious meltdown before this weekend. That usually means that we get a re-freeze later in March that offers everyone a week or two to go anywhere they want. 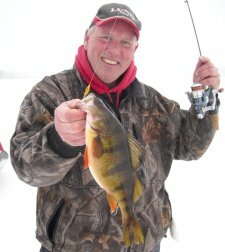 Now that the Walleye and Pike season is closed, the main focus on the big lakes has switched over to Perch fishing. According to most of the anglers I've talked to, the action out on Lake Winnie has been good, but the average size of the fish has been on the smaller side. Our better size Perch have been coming from Cutfoot, but there the average numbers have been low. I guess that means you can take your pick, lots of action and small size or not much action with good size. We've spent our last couple of trips chasing Bluegills and Crappie and in spite of the heavy pressure, the fishing has been fair. We haven't been tearing them up, but we've had a fish fry after every trip. Yesterday we fished from 4:00 PM to 6:30 PM and caught a half dozen Crappies and another half dozen Sunfish. We tend to get a lot of "lookers" on the flasher with about one out of five actually finally hitting the bait. I've tried a handful of baits and there aren't any big secrets emerging about what to fish with. For the panfish, when push comes to shove, I switch back to the old reliable small Demon tipped with a couple of Eurolarvae and this always seems to call in enough to make me happy. For the Perch, it's been really tough for me to beat the small Buckshot Rattle Spoons and the small size Jigging Rapalas. Today, I am going to try and pick up a few Tulibees to put in the smoker. I was struggling with my old smoking recipe, tried a new one and came really close to getting them perfect. One more batch should help me decide if I have it dialed in and if I do, I'll share the recipe. 2/21/10 Great weather and fair on-ice driving conditions have helped boost traffic on the lakes over the past week. Almost everyone I talk to has a couple of reliable fishing spots up their sleeves and the variety of fish being caught has been really impressive. We've been sticking with the shallow weedline pattern to catch a mixed bag of Perch and Walleye, others are sticking with the deep water Crappie and Bluegill action and there are still some Walleye and Pike anglers working the main lake bars and humps. Getting around on the ice is a little more tricky since the wind storm that blew in on Feb. 13. That wind created enough drifting to cause problems along the shorelines and around points or islands. If you have a larger 4X4 truck, you can go to 90 percent of your favorite areas, but don't venture on to the ice without a way to dig or tow yourself out. For our Perch and Walleye fishing, we've been finding the weedline in 6 to 10 feet of water near deeper holes. We're using the small Buckshot Spoons, swimmin' jigs and small Jigging Rapalas. There has been a lot of banter between my fishing buddies and me, but I've been fishing these baits plain without any minnow or minnow parts added and I've been convinced that it's helped me target larger fish. My buddies are using minnows and have been equally convinced that this is the better approach. A good compromise would be to fish two holes, one with a jigging rod and the other with a live minnow, maybe even below a bobber. The panfish anglers are using small size Rat Finkees, Gow Bugs or Demons and most of them have been using Eurolarvae or Wax Worms. Most of the Bluegill and Crappie action has remained in the 20 to 30 foot range but I've talked to a few anglers who are finding some fish moving in a bit shallower. It's a good idea to look in the 12 to 16 foot range. 2/8/10 We headed out to the lake Sunday after hearing about a good Crappie and Bluegill run that was going. When we got there, driving conditions were still fairly good, I saw a dozen or so trucks out there and they all seemed to be going wherever they wanted without much trouble. The snow started coming down around 10:00 AM and it's been coming down lightly for the past 24 hours. It wouldn't surprise me if we see the driving get a little tricky after this snow finally stops. But we'll know more about that when it's finished. On Sunday, everyone in the crowd was on the same pattern, targeting the deep water holes for Crappie and Sunfish. When I checked in with a couple of fishing buddies, they reported steady but slow action. I decided to go in and have a look at the shallow weedline for signs of an early movement into the shallows and drilled my first few holes in the heavy weed cover at about 6 feet and worked deeper until I drilled a couple where no weeds came out of the holes. The depth at the clear weed edge was about 7 feet and I saw some activity on my flasher so I dropped a small Rat Finkee tipped with a couple of Euro Larvae down the hole. The first fish I caught was a chunky Largemouth Bass so I was hoping that I'd find some Bluegills in the same area. The bad news, no Sunfish showed up. The good news, there was a great run of Perch moving in the shallow water. It started slow but built into a couple hour stretch of almost non-stop action. Size of the perch was mixed and included everything from small six inchers all the way up to some real jumbos in the eleven to twelve inch range. I'm sure that there would have been a lot of effective baits but using the small Rat Finkee allowed me to fish without using any live bait. I started with green and caught some fish, but when I switched to a glow & orange combination, the action doubled. When the action slowed down on that bait a switched to a small bucksot rattle bait and manage to trigger another action spurt. We didn't stick around long enough to check for any evening Walleye or Pike action, but with the Perch starting to move on the shallow weedline, it won't be long before we see more variety in these same areas. 2/3/2010 After a couple of weeks without a truck, I was anxious to get out of the house this weekend. Even though the temperatures this weekend were brisk, the sun was out and wind was calm so I picked up my fishing buddy and headed up to one of Deer River's good combination Walleye and Perch lakes. When we got there, some friends told us that they had been catching some Walleye in the 12 to 16 foot range, especially in the late afternoon. It was still early so we decided first to try shallow water for Perch. Moving around on the lake was easy. There are a few drifts from our last snowstorm, but they weren't deep enough to thwart our efforts yet. We stopped on one main lake hump to check it out and found only tiny Perch, so we packed up and headed even shallower. When we got into 6 to 7 feet of water, we found a good school of Perch and for a while the action was fast. Once we got the Otter set up and got comfortable, we decided to stay in that area and wait for the evening run of Walleye. Today, that didn't happen so I guess it's probably a little early to be fishing that shallow, but I think they'll be in there pretty soon. Our best baits were darker green, small buckshot spoons and I had a really good run using a 1/16th-ounce, dark green jig head with a small plastic grub tail. Since the truck was laid up for a while, I spent some time doing my homework on the subject of the US Coast Guard's Six Pack licensing rules that will be affect many of the guides and commercials operators this year. This is definitely going to impact me and many of the folks I work with so I have written an article to help get us up to spreed. It's too long to insert here, but if you're going to be affected, here's a link to US Coast Guard "Six Pack Captain License" Requirements. 1/14/2010 Wednesday was too nice a day to pass up so we drove up to Lake Winnie for some afternoon fishing. Driving conditions on Lake Winnie are excellent. We drove out of Highbanks Resort where the plowed road is about five lanes wide and in awesome condition. Once we were on the lake, we could easily go from spot to spot without any trouble. There might be 8 to 10 inches of hard packed snow and all of the vehicles we saw were riding high and dry. Traffic was moderate with several clusters of vehicles and portable ice shacks. Our game plan was to find and fish on a spot where there hadn't been any ice fishing traffic, so we passed by a few humps that had already received some pressure. After our third or fourth try stop, we found an "un-touched" hump and drilled a few holes. It didn't take long to find fish and in one of the holes at 22 feet deep, Walleye action was good almost immediately. We found that the fishing was best in the 20-24 foot range, most fish were running on the small side but as the sun dropped toward the treeline, the was a good flurry and we were able to sort out 11 decent eating size fish. After dark, the bite stopped and we didn't hang around to see if it would pick up again later. We used jigging spoons and jigging Rapalas tipped with either a whole minnow or a minnow head. I think the best lures were the lime green Frostees that Arne showed up with, but I caught quite a few on a generic Red/Black jiggin spoon as well. 1/10/09 I spent Friday and Saturday attending the Minnesota DNR Round Table meetings. A few of the topics affecting anglers that I'm most concerned about for the next several seasons are; cutbacks in the DNR Fisheries budget, increasing emphasis on regulations surrounding invasive species and growing concern about how to maintain water quality and fish habitat. The story isn't all gloom and doom, but if we expect our future to include the quality of fishing we enjoy now, we're going to be forced to make some adjustments in the way we manage our lakes, fish and finances. 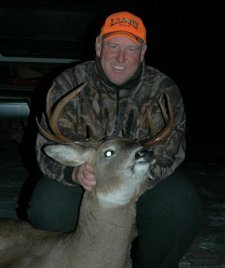 Early in the discussion on Saturday (1-9) was the news that the MN DNR will be facing an approximate cutback of $4.5 million dollars for 2010. You may already know that during the past few years all "general fund" revenues that the DNR once received were ratched down and now have been completely cut. Today, the fish and wildlife sections of the DNR exist entirely on the proceeds of hunting and fishing licenses along with some help from the (Dingell-Johnson) federal excise tax on hunting and fishing gear. One way to recover some lost revenue will be to ramp up sales of the voluntary Minnesota Walleye Stamp and the DNR announced it's marketing strategy for 2010 aimed at making anglers aware of the option and to encourage more of us to buy the stamp this year. 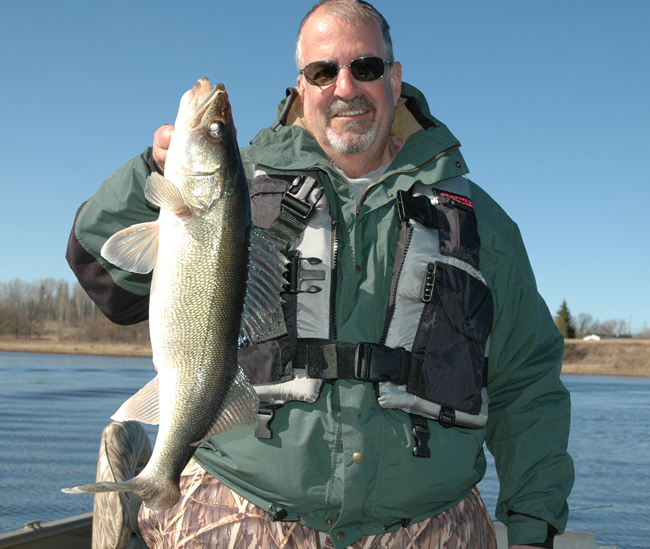 That would help Walleye anglers, but won't do much to offset other budget losses. Naturally, the next option is to look at increasing fishing license fees. At this point, the discussion is only hypothetical, but for Minnesota residents, it's already been ten years since we've had a fee increase so I'd expect this idea to gain traction and advance fairly quickly. An interesting twist this year was that for several presentations on Sunday, the fisheries group and the water legacy group were combined. Combining the two groups shows that the DNR plans to involve anglers for a greater focus on water quality and habitat issues in the future. The group Anglers for Habitat that formed shortly after the 2009 round table has already started picking up a head of steam and has begun building a membership of volunteers and I expect to see them emerge as a big supporter the angler and water collaboration. Now that I'm home for a while, I'm going to get going on some fishing and try to get up to speed on what's goiong on in the area, but I'm going to have some more thoughts about the round table too and I'm sure you'll have some questions. I think i'll move this discussion over to my facebook page because we can use that like a blog, so if you want to make some comments and you're on facebook, just search for The Early Bird's Minnesota Fishing Group. 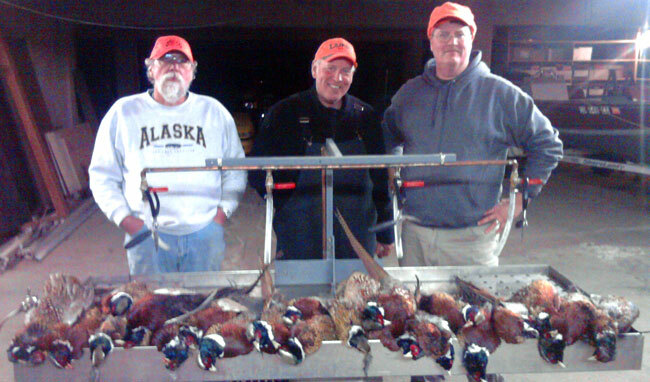 1/6/2010 We took off last week to spend the beginning of the New Year in South Dakota for the the last Pheasant hunting trip of the season. This was my first trip out to South Dakota, but my friend Chad Haatvedt has family out in Huron and they were friendly and welcoming in every way. Even though the weather was cold and the snow deep, we managed to keep after the birds and found plenty to keep us busy. Thanks to Chad's brother Cy and his friends, the areras we were allowed to hunt gave us the kind of hunt that most of us only dream about. I can't thank these folks enough for the great memories I'll always have of this grand finale'. Back on the subject of ice fishing, I took a drive around the Deer river area lakes on Tuesday and found ice great ice conditions and lots of new houses on the lakes since last week. On Lake Winnie, there are plowed roads, but except for some drifting along the shoreline, most of the time you will not have problems driving in the standing snow. I've heard various reports about the ice thickness but generally, there is a foot or more on most lakes and some are reporting 14 to 16 inches of ice. The cold weekend didn't help the anction, but folks are talking about catching enough fish to keep it interesting. My first chance at getting some first hand fishing won't come until early next week as I'll be travelling to the Twin Cities this weekend for the 2010 MN DNR Rountable meetings. 12/22/09 On Monday 12-21-09 we drove up to Red Lake and rented an ice house from my buddy Chad Benson. Ice conditions are getting better every day and we had no problems driving the truck out to the house. There isn't much snow up there yet so plowed roads aren't really needed yet, but they've got the trail marked and plows are ready to go when needed. Fishing was decent, but not wide open. We spent about 8 hours fishing and caught a total of 20 Walleye and 3 small Pike. Chad was out scouting for new spots to set his houses and he caught several Walleyes and one of the few, but still nice Crappies that remain in the lake. Daytime fishing was sporadic, but there was a flurry of action between 4:00 and 5:00 PM. Although we had heard that the fish were finicky, the ones that came in seemed to be fairly agressive though and most of our action came on jigging spoons tipped with whole, small shiners. Our set lines and bobber rigs didn't produce many fish. Over the past weekend, the action really started heating up all over the state. I heard good fishing reports from almost everywhere. We were on a road trip down to the twin cities and saw large groups of ice fishermen on lots of the lakes we passed. 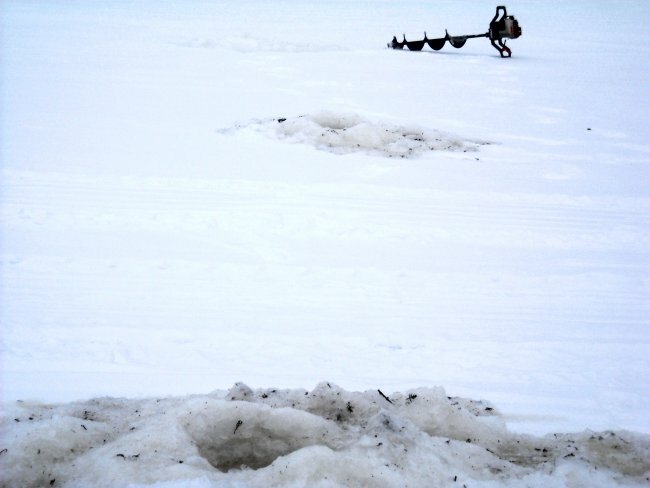 Mille Lacs had lots of ice houses on the ice, but we saw only ATV's moving around on the ice. There were a few lakes further south that had some light trucks parked on ice near shore, but no sign yet of folks driving out on the "metro area lakes". 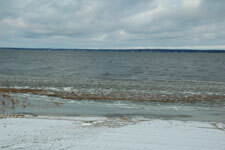 Closer to home, the action on Leech Lake and Lake Winnie has been good. Perch and Northern Pike are hitting on the shallow, shoreline drop off areas and also on the weed flats. On Winnie, Walleye action has been mainly on the mid-lakes humps at evening. 12/14/09 Oaky, addiction satisfied. I thought this was going to be my year of no Bucks, but I was too dumb to quit hunting and finally bagged a nice 9-pointer on Saturday. Just in time for the serious onset of winter. I'm guessing that you already know that we have good ice on lots of Itasca area lakes already and we're making a couple of inches of new ice every night. On Saturday I talked with my friend up on Red Lake and he told me that they had about ten inches of good ice already but when the deep freeze hit, a lot of small cracks opened up so you need to go slow when moving around. There are some people fishing already and they are getting serious about putting hoses out. Walleye were biting in about 9 feet at sunset. Closer to home, there are dark houses showing up now on a lot of lakes and over the weekend I saw a couple of trucks parked on ice close to shore. I haven't seen anyone driving on a lake yet, but I do expect that in the next couple of days. According the folks at Fred's Bait, traffic was heavy on Saturday and fishing reports will start to trickle in during the next few days. 12/11/09 The Deer River area and most of the territory North to the border missed out on the big snow storm that hit Southern Minnesota. The lack of snow combined with sub zero temperatures are producing lots of ice in a hurry. Newly ice covered lakes are popping up every day now and the lakes that have frozen already are gaining 2-3 inches of ice per day. I took a road trip on Thursday and found Lake Winnie from the Dam out into Tamarack Bay and from Bowen's out into the main lake to be completely ice covered. If there is any open water in the middle, I can't see it. Folks have been fishing the Third River area for almost a week already and so even though I didn't see any traffic on the main lake, I expect the picture to change a lot this weekend. A stop over at Cutfoot Sioux also revealed McAvity Bay to be totally ice covered. Again, no traffic yet, but this too will change over the up-coming weekend. Driving through Deer River, I saw a half dozen rigs with portables and ATV's. Traffic at Fred's Bait has been spotty, but the anglers are starting to trickle in. A friend and I were texting on Tuesday when he reported catching his first Walleye of the season while fishing on Red Lake. If you don't have your gear together yet, now is the time to get set up. Within the next week you should be on Green For Go everywhere except the most stubborn, deep water lakes. 12/7/09 For the most part, lakes are still open or have only a thin layer of ice. But things are starting to happen fast now and the folks at Dixon Resort have put some of their rental houses out on the Third River Flowage at Lake Winnie. According to Bill Powell at Fred's Bait in Deer River, they (Dixon Lake Resort) started renting dark houses on Sunday 12-6-09. 12/3/09 It's hard to complain about the weather we've had this past month. It's been great for travelling and we've had some really nice hunting experiences. Now it's time to start watching for the first signs of ice again. 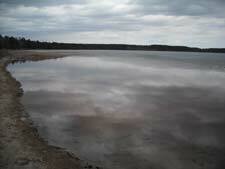 I took a tour of the Deer River area on Wednesday and most of the lakes are still wide open. There are a few small lakes between here and Grand Rapids that have ice on them now and so with temperatures in the teens, it shouldn't be more than a few days before we start seeing some darkhouses popping up. I'll be checking lakes somewhere every day and try to keep the updates coming often. There are lots of folks watching the conditions, so if you see a frozen lake, report your ice conditions so we can map the progress. Be sure to listen or go to KAXE 91.7 FM Grand Rapids Radio on Thursdays at 6:20 AM. We usually try to expand on this report. If you miss the show, you can pick it up on the website. Check back for a weekly fishing update (usually on Wednesdays). Ask fishing questions if you need to and I'll try to get back to you ASAP. 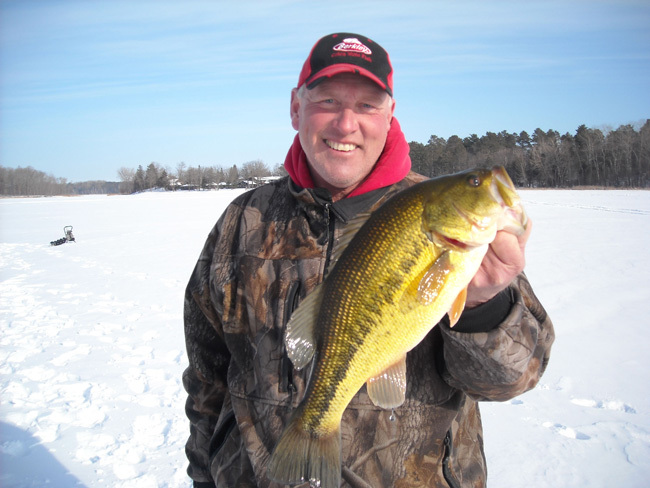 Use these links to read Minnesota Fishing Artcicles and get information about my favorite MN Fishing Lakes. Crappie location is shifting away from the spawning beds toward nearby weed flats. Soon, most of the fish will inhabit mixed Cabbage and Coontail flats adjacent to deeper water. The Ripple Shad has been catching fish for me ever since I dropped the first one in the water last fall. So far this spring, the results have been great. 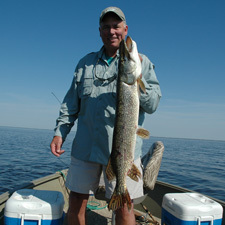 Northern Pike are roaming in areas where concentrations of baitfish and small Walleye are present. So far, we've caught our largest pike on jig and minnow while fishing for Walleye. Medium sized, fish like these pull a lot harder than you'd expect. A heavy rod like Loomis' Frog Rod (below) is perfect for this job. None of us have aver kept a Sturgeon to eat, it's all about the giggle factor. While we were Sucker fishing we had a visit from the gamne warden. 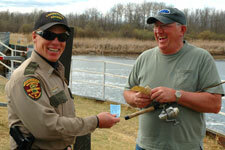 Local Conservation Officers keep a close eye on the rivers during the early season. When asked if I could snap this picture while he was checking my buddies fishing license, he told me that people ask all the time. It looks like he's a natural. Did anyone mention that it's a bad idea to sit with your back to a Pike? Big fish action on the Rainy is slowing down, but it's not over yet. Meanwhile, the smaller males are getting more aggressive. Pitching his jig up onto the edge of a shallow flat, Matt Mattson managed to trick one the big ones. Pete Raquet with a chunky Rainy River special. Recognize this man? We snapped a picture for him yesterday and I have a couple of good pics if he wants them. 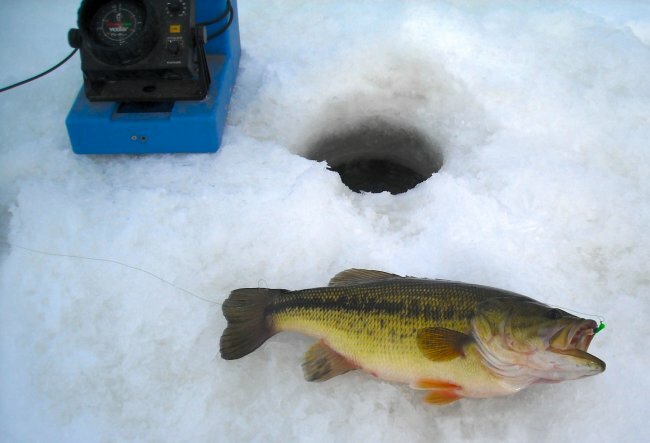 Who says you never catch bass through the ice? Stay on the weedline and you will. After a good run of action with the Rat Finkee, I switched to this small Buckshot Spoon and had another good flurry. Not all of the Perch were this nice, but knowing that there's a few like this down there, keeps you fishing. To fish close to the weed eges, start where there are known weed beds, dirll in the shallowest water first and move deeper until you come to the first one that appears clear. All fish love the weedline. You don't see a lot of Bass in the winter, but its not unusual when you fish heavy weed cover. The recent snowfall was minimal in the Deer River area and we were easily able to travel by truck. On Sunday, we found Perch in 6 to 7 feet of water. No Walleye yet, but they'll be in there soon. By sorting through a bunch of small Walleyes, we were able to save some nice eaters for a meal. Most of our Red Lake Walleyes were in the protected slot between 17 and 26 inches and they're a lot fatter than they were a couple of seasons ago. We did manage to get a half dozen perfect eaters under 17 inches, just right for a fish fry. Here's the view of Lake Winnie from the Winnibigoshish Dam on 12-10-09. 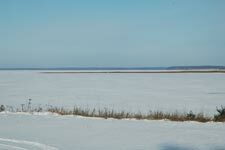 There are no ice houses out on Tamarack bay yet, but there is now ice cover as far as the eye can see. Expect to see traffic out there in the next few days.